Being a wedding photographer Tuscany I photograph quite a few weddings in the region. But it was great to go back to this particular venue which was my first in Italy. My second time as a Casa Cornacchi wedding photographer – it was funny to return to this beautiful Tuscan wedding venue. It’s the same venue that I visited in the past, but the trees had all grown a little. The staff have made lots of small refining changes. Anyone who picks a wedding dress with multicoloured flowers on is a person whose wedding I want to go to! And so starts the top 5 things I loved about their day. 1. The wedding dress. After seeing the dress I knew it would be a colourful day with colourful people. 2. The people. Their friends and family were so much fun. The party started the night before and didn’t stop until I left at 12:30 the next day. Everyone was in the holiday spirit. 3. The weather. The days leading up to their wedding were pretty mixed, but on the day I thanked myself for bringing the sun cream! 4. The ceremony. 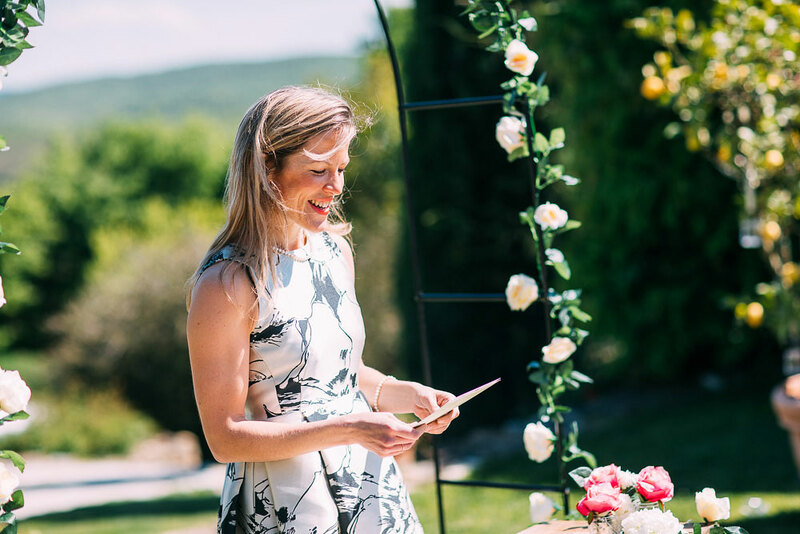 Jo Bertolini was an amazing celebrant and the wedding readings were beautiful. Holly’s cousin Olivia sang during the ceremony. When I heard she was going to sing I didn’t realise she could really sing. 5. The dance moves (see the photos) were brilliant – a big shout out to the Pink Panther DJ. One of the things I love about photographing weddings in Tuscany is the light. At the Pizza party the night before I got to do a little more location scouting and found some great spots higher up on the hill. It was wonderful to work alongside Alessandro from Love Tales. I would recommend any couple getting married in Tuscany to look at his work and see if it resonates. He was so easy to work alongside and he bought a drone! A MASSIVE thank you to Holly and Graham – you made me feel so welcome as soon as I arrived. Graham offered me Pizza three times and Holly was so easy going. 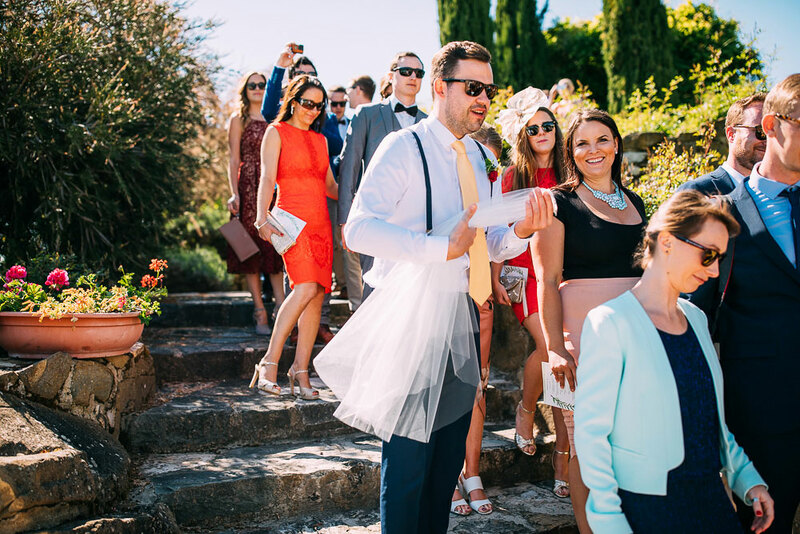 Even when her veil made a dash for the exit she stayed cool and laughed! If you ever decide to renew your vows and need a photographer hit me up! Whether you are having a Tuscany Florence wedding then I have been there! I have travelled to Sienna and Luca although I have not yet been to Venice (that is on my bucket list!) Italy is so easy to reach for me and I’m really passionate about photographing weddings there (and it’s not only for the food!) So if you’re having a wedding abroad and need a destination wedding photographer and like my work, do get in touch! 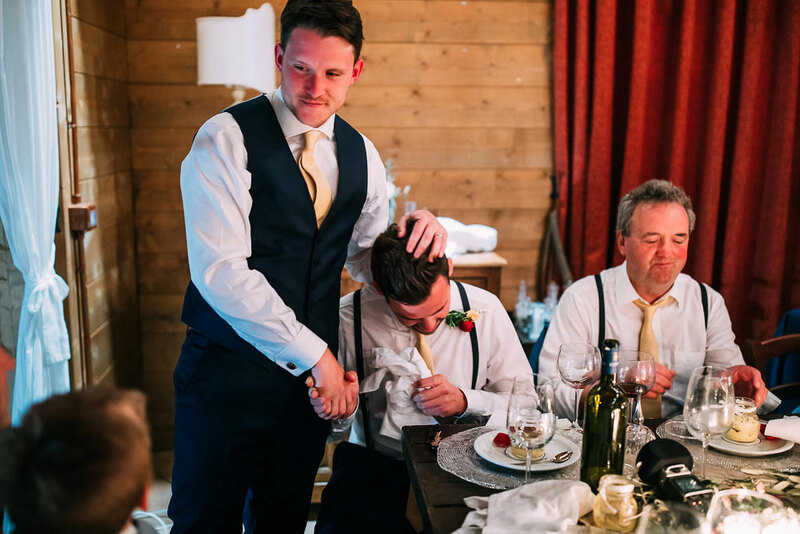 Now here are a few of my favourite photos their wedding in Tuscany. Wow, Albert…! Where to start! What an amazing dress. Great set of images. Beautilful storytelling images, love the featured image with the couple backlit by the sun.